Growing up as the second oldest child in a family of 10 children, Martha Burch of Martha's Bears learned sewing, crafting, woodworking and basically anything to do with using her hands and imagination. "There were so many of us, we always made things. It was our mother's way of keeping us out of trouble." That background gave her a firm love of hand work that has stayed with her throughout her life. Early on, Martha learned to sew and did alterations and custom dress making, but always loved the antique business since her mother was an antiques dealer. "Something about old lace and fabrics speaks to me." One day, her mother was about to donate to charity, a box of quilts and textiles that were too damaged to sell in the antique shop. Her mother asked Martha if she would like to take them. 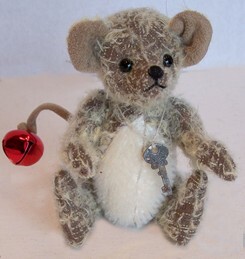 "Of course, at some point, one has to use these things or move them, so I designed a dumpy little, string jointed, button nosed, teddy bear and made a batch of them from the old fabrics." She gifted her large family with them and the leftovers went into her mother's antique shop. They sold the very same day! Martha took the hint that she was onto something. 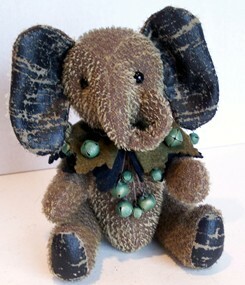 She made little bears for three years and traveled to Folk Art shows with her mother. It as at one of those shows that she ran into some one who was making mohair teddy bears. "She told me about teddy bear magazines and mohair suppliers. I was ecstatic to find that I could actually buy this wonderful fabric by the yard." Her first box of mohair arrived. She couldn't believe that she'd paid $500.00 for the tiny box that turned up on her doorstep. "It took me a week to work up the courage to cut into it!" 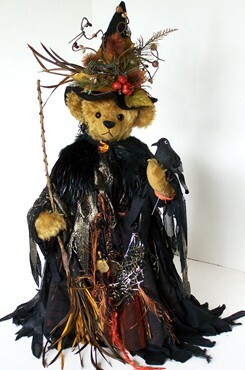 Martha designed another bear that had jointed limbs and head; since then, she has never looked back. 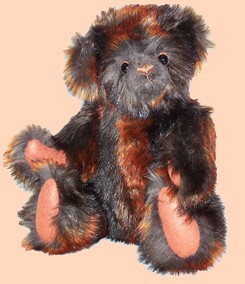 "My first bears were very different than those I make today. Back then, there were no classes and few 'how to' books, so everything was trial and error. 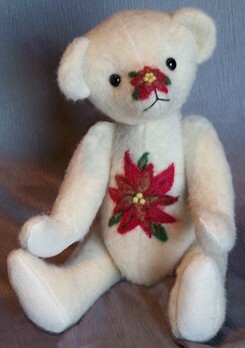 I taught myself to make my signature nose and now I try to design several new bears and buds patterns each year." 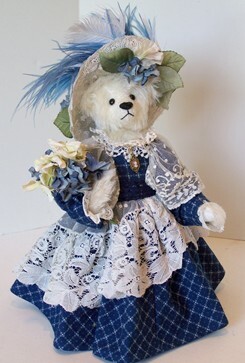 Through the years, she's tried engage family and friends to help make the bears by asking them to cut pieces or help with stuffing or the jointing, but Martha was never quite satisfied with having someone else do the work, so now she does everything herself. 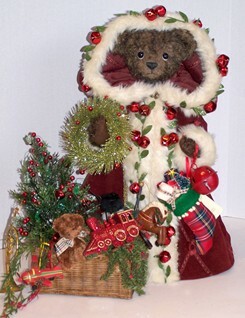 Martha participates in quite a few bear shows each year and several local craft shows. "I prefer going to the shows, even though I have a web site because it gives me a chance to actually meet the collectors who love my work." She teaches classes on bear making whenever a group wants her to do so; teaching everything from basic bear making to pattern designing. 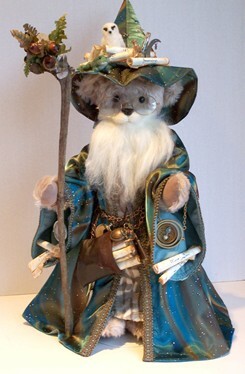 "I have become known for my dressed bears. I LOVE costuming and the challenge of making an idea into reality. 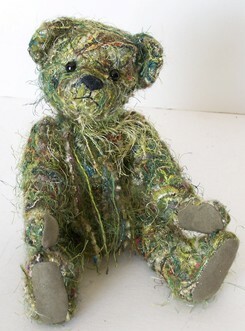 I make some bears using recycled coats, textiles and recently have begun making my own bear fabric using multiple yarns that are stitched in a random pattern to a canvas backing." This creates an interesting look and the color combinations are endless. Martha's won numerous awards and been featured in several magazines and books; is a guest speaker at several conventions and been a guest auctioneer at Charity Teddy Bear Auctions. "It would seem that teddy bears would take up all of my time, but my husband Jim and I play in a local Bluegrass band on weekends when I am not on the road going to teddy bear shows. 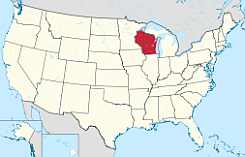 We are called the Big Cedar Bluegrass Band and we have been playing for 20 years now." 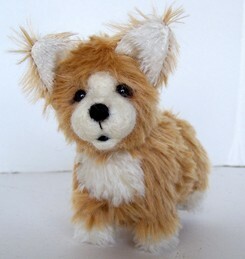 "I love designing and making teddy bears while getting out into the community to meet the people who collect them. Every time that I feel it's time to venture on to something else, I will meet someone who has been touched by one of my creations in such a way that I know that this is what I am supposed to be doing." Martha shared with us a story of a client that touched her deeply. 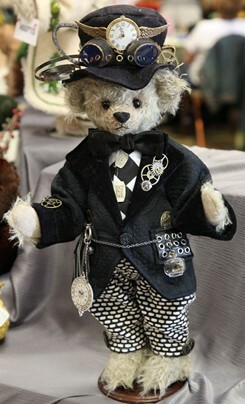 "A woman came to my booth at a teddy bear show with a 1960's coat, several accessories and a picture of her mother. She asked me to make a teddy bear and dress it to resemble the picture. I did just that and when she came to the show to pick up the bear, I saw her coming through the door, she stood still, looking at my table where the bear stood, gazing at it with tears running down her face." Teddy bears do have the ability to reach into our hearts and touch those special memories we have of times and people we love. 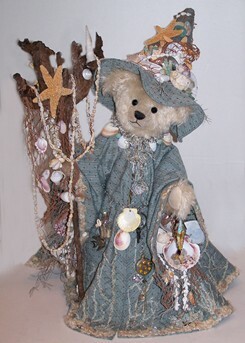 "With teddy bears in our lives, we all can find that softer side of ourselves that the fasted paced world sometimes forgets about," Martha noted, "so I keep on sewing." Collectors a one year subscription to Bears&Buds is just $15.00 and you'll receive a password to enter the Collectors' pages. 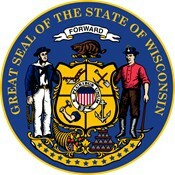 Artists become a Member of Bears&Buds today! Advertise FREE! Password will take you to the B2B section loaded with selling, making and how-to ideas.